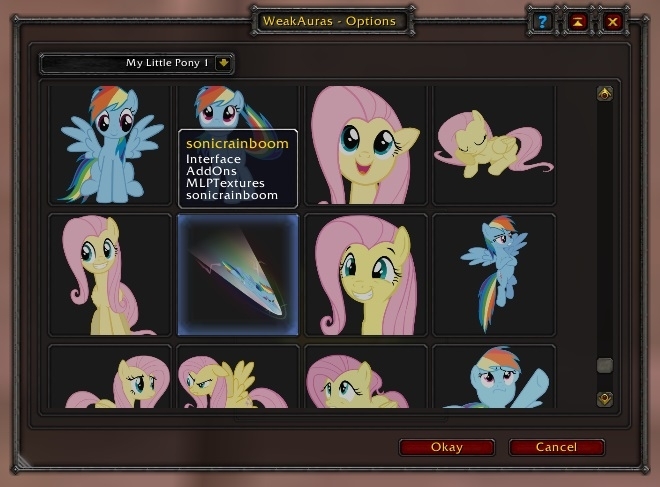 This is A modifcation of the Types.lua file found in WeakAuras/WeakAuras 2 to display custom My Little Pony textures. 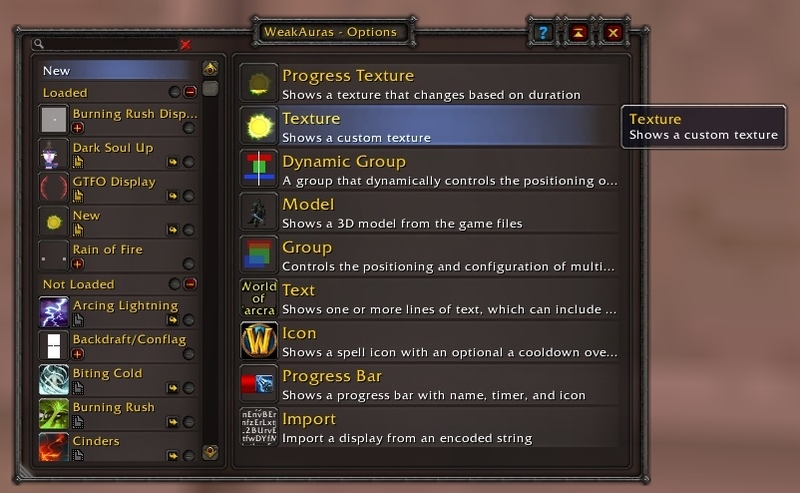 You can find a preview of all 676 textures here. 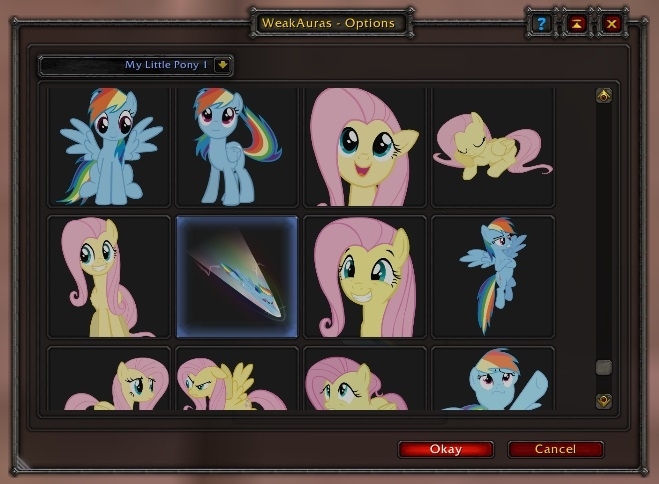 This was made with full respect to the WeakAuras developers. 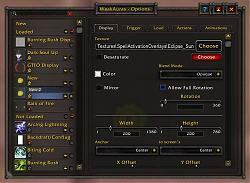 Please come to me with any bugs/issues regarding this modification. Feel free to leave a comment or drop me a PM with any issues, comments, or suggestions you might have. 1. Backup all settings before continuing. 2. 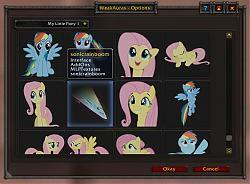 Copy the "MLPTextures" folder to your "World of Warcraft\Interface\AddOns\" directory. 3. 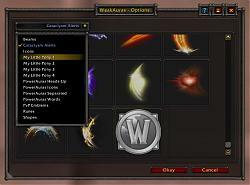 Copy and overwrite the "Types.lua" file to your "World of Warcraft\Interface\AddOns\WeakAuras\" directory. 4. 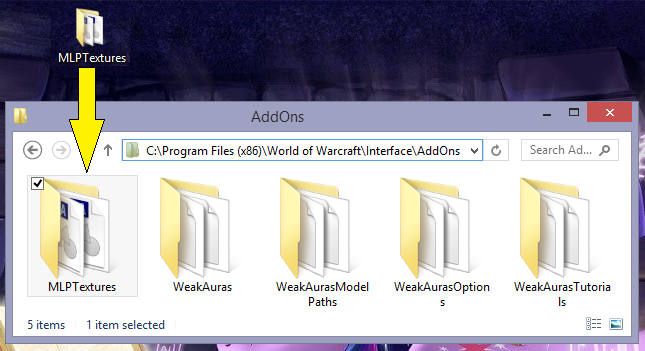 Launch WoW and type /wa to open configure Weak Auras. 5. 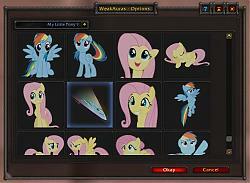 Click to choose custom texture, and in the drop down box select My Little Pony 1-4. 6. 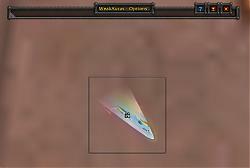 Select a texture then click okay. 6a. 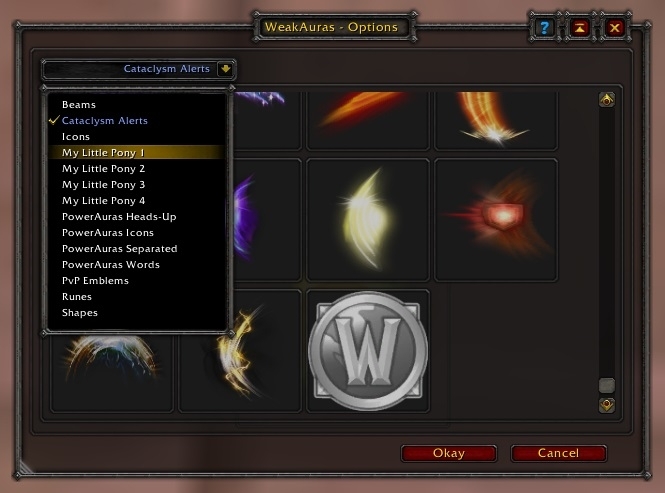 Be sure "Allow Full Rotation" is NOT checked. 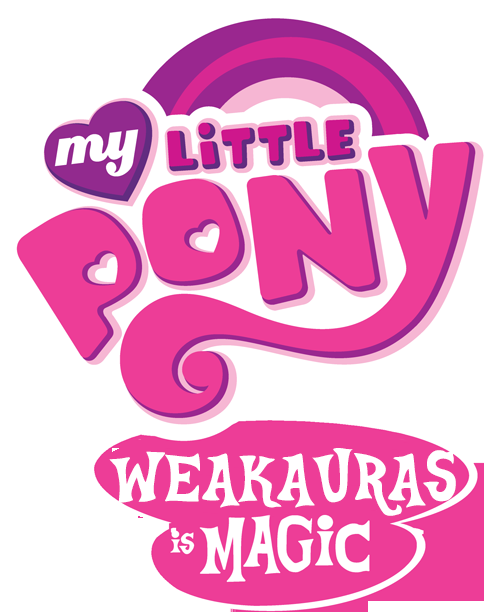 and that's very odd that it does that.. hopefully they fix that soon. 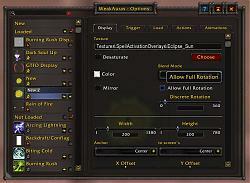 that happens if you have the "Allow Full Rotation" setting checked. Make sure you have it unchecked and all should be good. 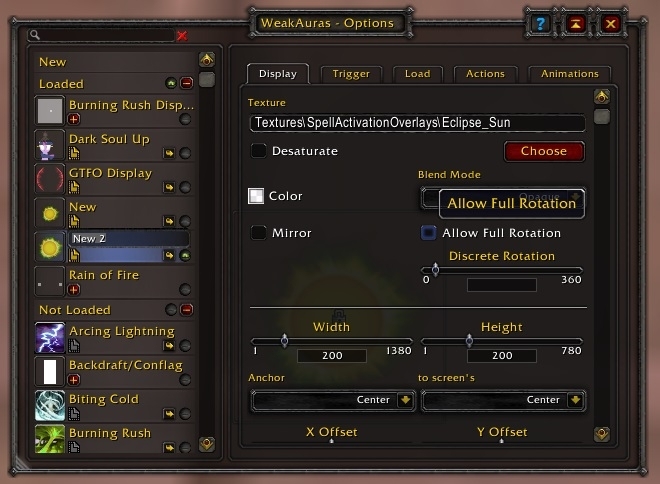 Edit: It seems that the "Allow Full Rotation" setting resets to on each time you go to create a new aura. I believe this is a problem with Weak Auras, and I will submit a ticket to them about that. 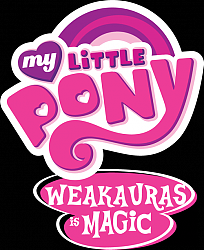 Last edited by RealmEater : 07-20-16 at 09:35 PM. did I just end up doing something wrong and that caused this? Thanks for letting me know! 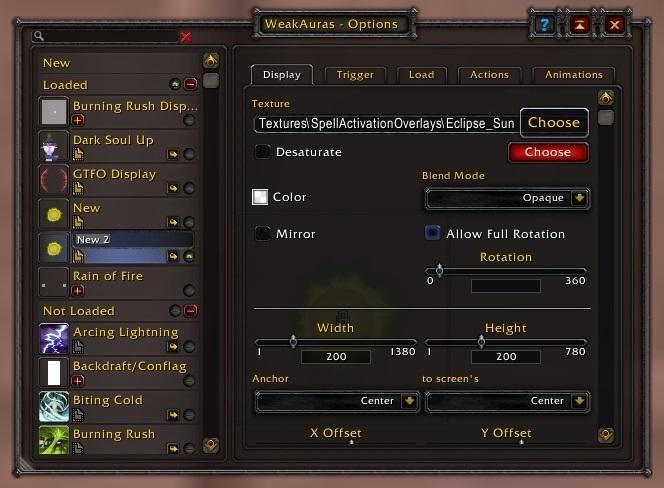 I don't think this an issue specific to 7.0.3, but something that happens if you have the "Allow Full Rotation" setting checked. Make sure you have it unchecked and all should be good. Last edited by PacGamer : 07-22-16 at 10:28 AM. 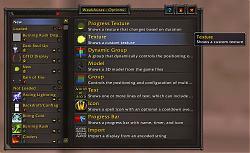 If i overwrite the required file i can't see WA options. Any plan for an update? Updated, should be good to go now. Let me know if anything else comes up. Thanks! Definitely, thanks for letting me know! I'll look into it later today. 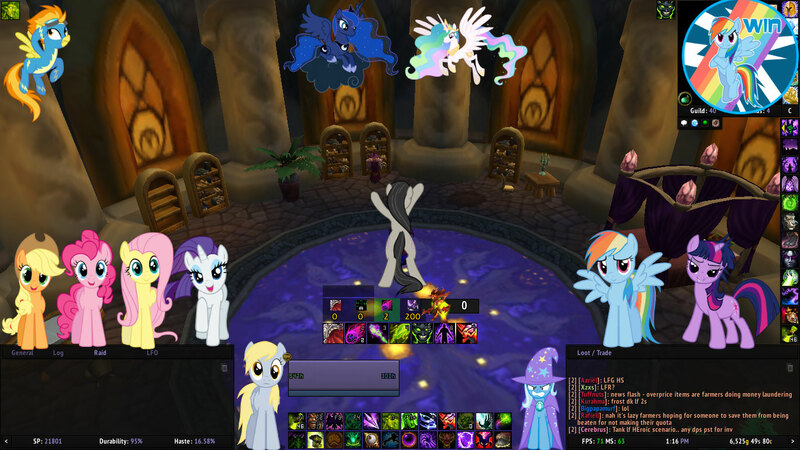 The My Little pony UI's are coming now. I can sense it. Last edited by 10leej : 05-01-13 at 06:06 PM.